This is a 2 bedroom, 1 story, 1725 sf (to the outside) house that is designed around the traditional hogan concept of Southwestern native Americans. It would be dug into a hillside, or bermed substantially on the north side. A large south-facing living area with a vaulted cieling provides passive solar heating for much of the house. The bedrooms, bathroom, pantry and kitchen surround the traditional octagonal shape. 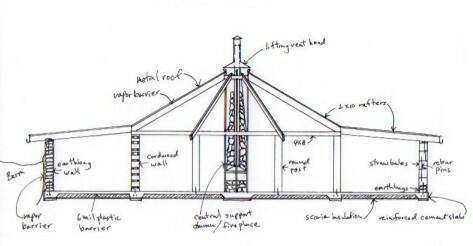 This was originally designed for the Sacred Mountains Foundation as a demonstration home for a variety of natural building techniques, so that it employs cordwood, strawbale, adobe, rock, earthbag, and timber-frame aspects. The southern elevation shown on the left would be post and beam with cordwood infill. There is a unique central fire place, open 360 degrees, for back-up heat and ceremonial purposes. The large core room could accommodate large groups, or be utilized in many ways. The central octagonal roof structure hinges on a massive collumn in the middle, made of welded steel and natural stone. Combustion air for the fireplace is provided through the same steel tubing. An adjustable vent hood at the peak can be raised to vent indoor air directly outside. The stones provide thermal mass to hold the heat from the fire and radiate it back into the space. Other rock and adobe walls serve as additional thermal mass. Large vertical posts at each corner of the octagon are exposed inside and out. 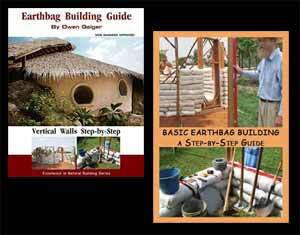 Depending on the position of the wall, the infill materials are corwood, earthbags, stone, adobe or strawbale. The insulated floor could be adobe, flagstone, brick, pavers, or colored concrete for additional thermal mass. The metal roof could be guttered to collect rainwater in a cistern. Traditionally, the native Americans enter their abodes from the east, so this where the airlock entry is situated. This large space can also serve as a closet and storage room. 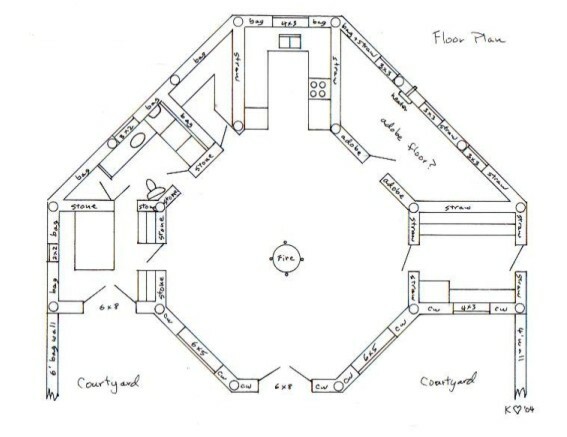 The large octagonal room is undifferentiated, but would serve as living, dining and ceremonial space. To the west is the master bedroom, with adjacent bathroom. To the left of the kitchen alcove is a large pantry that would be naturally cooled by its substantial earth berm. A second bedroom or studio faces the northeast. A large fenced courtyard area to the south provides privacy and wind protection. *These plans include all four elevations, scaled floorplans, cross section details, other significant construction details, and a written, sequenced list of all steps necessary to complete the project, with further details for how to accomplish the tasks. No shipping charge since this is a down-loadable plan. The PDF file will be emailed to you soon after ordering. At the moment, there is only one set of plans available of a cordwood version of Sacred Mountains. I am interested in your plans but would like to make changes. Can you do that? Email Kelly for this design. I no longer do custom designs. But I sell the CAD files which can be edited by any architect or engineer.